MOUNT AIRY, N. C. – Taking a hike on a trail or casting a line into a creek is something many people take for granted, but it's a luxury for thousands in the state who live with a disability. Thanks to state and federal funding, that's changing in many parts of North Carolina, as the state works with communities to create accessible areas for people who have mobility challenges. 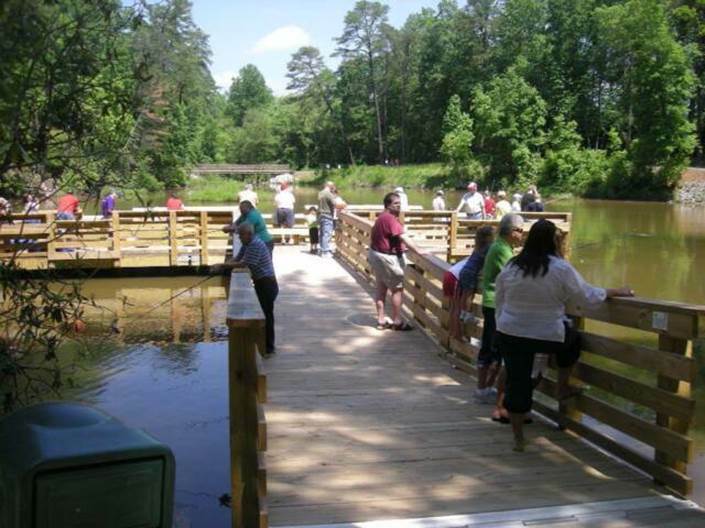 Kin Hodges, District 7 fisheries biologist with the North Carolina Wildlife Resources Commission, says the Americans with Disabilities Act (ADA) compliant areas provide a meaningful experience for people who lacked access for years. "It gives us all the ability to step away from our daily troubles and stresses, and kind of recharge our batteries,” says Hodges. “But certainly, I'm sure that feeling is even more magnified for folks that have much more limited opportunities, and they probably appreciate it even more." The state works with the nonprofit Resource Institute to identify government funding, and Parks and Recreation Trust Fund Grants, to pay for many of the ADA projects. More than 50 areas in the state now offer recreational access for people with disabilities – including features like paved pathways, accessible parking, and ramps to and from parking lots and docks. The City of Mount Airy just completed more than six miles of ADA-compliant trails – with Resource Institute assistance to locate funding. Darren Lewis, assistant director with the city's Parks and Recreation Department, says the project receives accolades from residents and visitors alike. "A family member, or sometimes it's a caregiver, have just praised the City of Mount Airy in general on the offerings that they provide, and being able to have this facility or service out there that everyone can use," says Lewis. Other recent projects include work at Tumbling Rock Reservoir and Hanging Rock State Park, where accessible piers were built for people to fish and enjoy the water. Hodges says the benefits extend to parents, who are able to bring children in strollers, and older people with mobility issues. "There was a fellow down there with his 92-year-old father, and just seeing him out there really just put a smile on our faces,” says Hodges. “These accesses do get used." Hodges says creating ADA-compliant trails and lake access is somewhat easier than building more direct access to streams and rivers, where the landscape can be difficult to shape into wheelchair-friendly terrain.